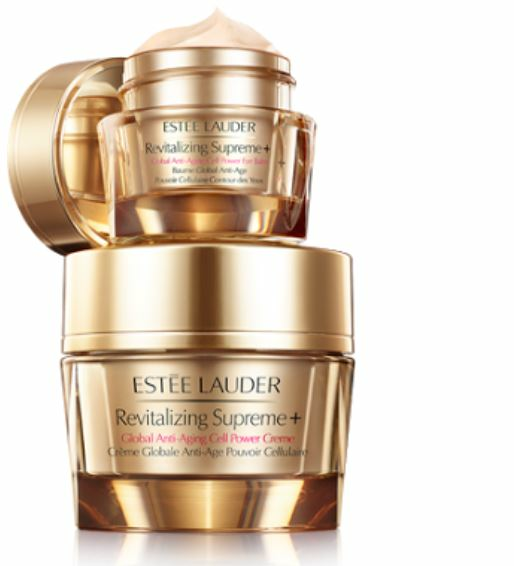 Add new vitality to your skin with Estée Lauder Revitalizing Supreme + ! Estée Lauder has the key to younger-looking skin with their Revitalizing Supreme + collection which unlocks skin's youth potential to see it spring back with new bounce and glow with radiant vitality. The products contain an exclusive RevitaKey technology featuring exclusive moringa extract that offers skin renewed firmness bounce and elasticity, healthy radiance and a youthful glow. Revitalizing Supreme + Global Anti-Aging Cell Power Creme - 50ml - $97 - a silky-soft, deeply nourishing multi-action creme for all skin types that encourages skin's natural power to amplify collagen and elastin to dramatically reduce the look of lines and wrinkles look dramatically reduced while skin's visible firmness, density and elasticity is significantly improved. Revitalizing Supreme + Global Anti-Aging Cell Power Eye Balm - 15ml - $75 - a richly nourishing, multi-action balm that can be used day and night to hydrate, firm and smooth the look of lines as well as puffiness and dark circles leaving the eye area looking radiant. For an added boost, can also be used as a weekly eye mask - apply a generous amount, leave on for a few minutes, then blot off excess with a tissue.